Sarah Jessica Parker has cut ties with Mylan, the company that makes EpiPen, after it was criticized for raising the price of the life-saving allergy product by 400 percent. Parker announced her decision this morning on Instagram. 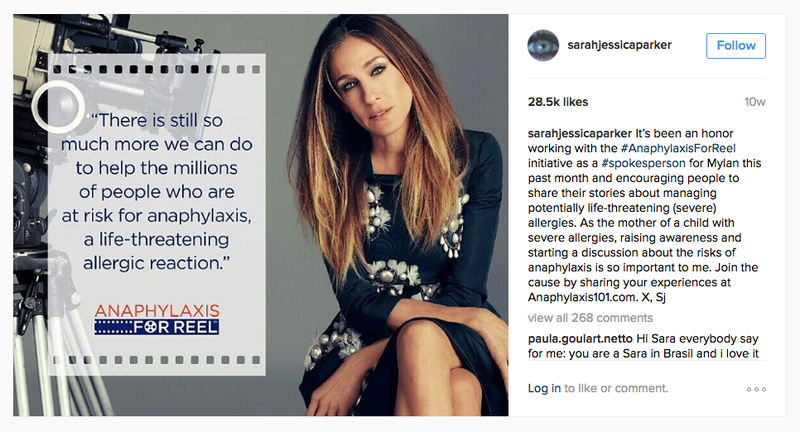 Sarah Jessica Parker became a paid spokesperson for Mylan in May of this year and spoke about her son’s life-threatening allergy on behalf of Mylan’s Anaphylaxis for Reel™ campaign. Parker appeared on TV shows like The View, The Doctors, and Access Hollywood to talk about her son’s peanut allergy. Gizmodo was the first to report on Tuesday that Parker’s role as a paid spokesperson for Mylan didn’t always include a disclaimer that she was speaking on behalf of the company. For instance, her appearance on the TV show The Doctors never mentioned that she was paid by Mylan. According to Parker’s publicist, she was always upfront with producers about her role with the company. Parker contends that she was upfront in her social media posts, making it clear that she was a spokesperson for Mylan. Below, a screenshot from Sarah Jessica Parker’s Instagram page, when she did Access Hollywood and told the story of her son’s life threatening experience with anaphylactic shock. We’ve reached out to Sarah Jessica Parker’s publicist for further comment and will update this post if we hear back.